Opening Saturday 22 September 14.00 – 17.00 hrs. A meeting between two prominent artists at De Ketelfactory in Schiedam for the exhibition series, series. Christiaan Kuitwaard and Philip Akkerman discover the power of paintings in series. This could be a set of five paintings, or four thousand. 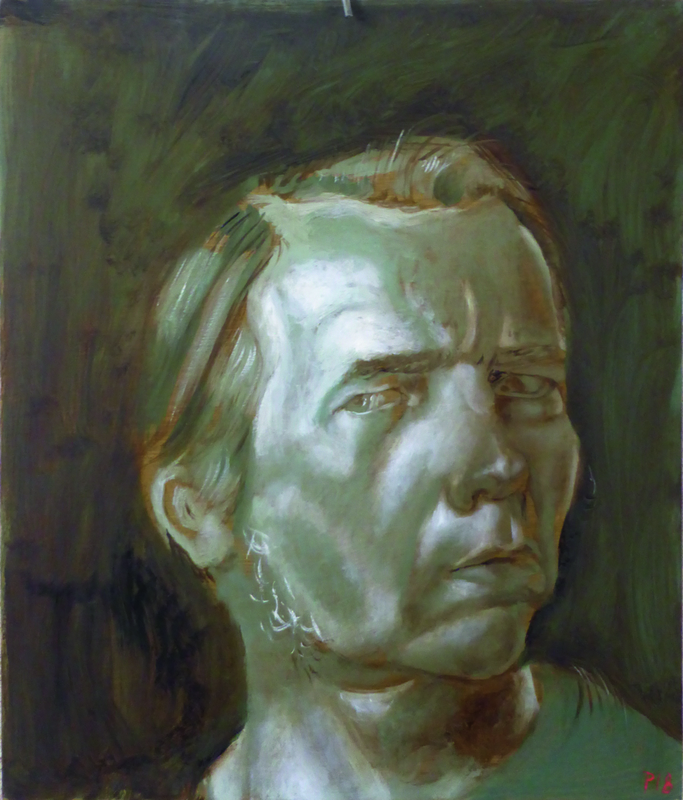 Kuitwaard has worked on the series White Box Paintings since 2010, and Akkerman’s focus has been on the self-portrait since 1981. Their art in series are examples of a coherent set strengthening the individual works within it through a tantalising game of meaningful exchanges. For the exhibition series, series, Kuitwaard and Akkerman have selected dark works, all of which very recent. Kuitwaard replaced his white box for a black box, which makes for surprising results. 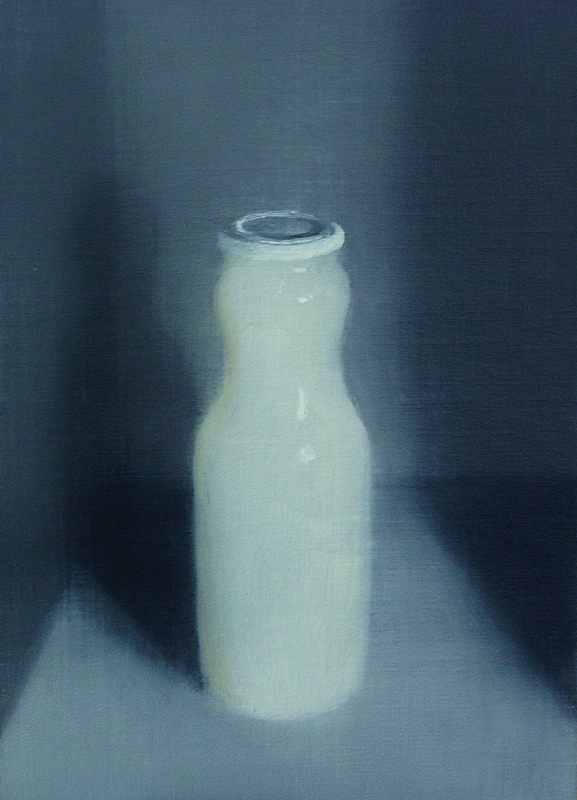 In a small black case, he captures the shimmer of a transparent bottle. The concept of ‘darkness’ opens up a new dimension in Akkerman’s dazzling series of self-portraits: each of his new works, however deep black, has a bright white base. The white has a fascinating way of filtering through the black. If you would like to receive an invitation for the opening in the post, please subscribe here. As part of the exhibition ‘series, series‘ by Christiaan Kuitwaard and Philip Akkerman we are expecting another attractive Distillation day with an elaborate programme. We start with a tour by Christiaan and you will have the opportunity to view Kim Everdine Zeegers’ video portraits of Christiaan and Philip. Florette Dijkstra (1963) is an artist and a writer. She regularly creates leporellos and wonders why every book is not shaped like one. In her lecture she explains the harmonica book’s curious capacities. Subsequently, Philip will be reading fragments of his diary. Before we end the day with a delicious meal cooked for us by De Buurtvrouw, we will be treated to a fitting performance by the promotor of the classical accordeon, Vincent van Amsterdam. Vincent won the Dutch Classical Talent Award in 2016 as well as the jury’s award at the Nederlands Conservatorium Concours in 2014. In short, we’re in for a treat! We are very curious to see his ‘musical leporello’. Cost: € 15. Reservation is required. To book you place please send an email to info@deketelfactory.nl. Places are limited so don’t wait too long! The exhibition is accompanied by the publication ‘De magie van het atelier: hoe licht schittert in een black box en het zelfportret geen spiegelbeeld is’ by Christiaan Kuitwaard and Philip Akkerman, including a text by Kester Freriks. Also his other book: ‘2314 Self-Portraits 1981-2005’ is on display. This book can be ordered at bol.com for € 19,50.